Thaddeus W. Harris named this skipper after the last important chief of the large Pequot nation based in Connecticut. The English attacked and decimated the Pequots in 1636; Sassacus escaped with a small group of supporters, but was killed by the Mohawks in 1637. The “Sassacus Skipper” (along with Leonard’s and Hobomok) is one of the upland grass skippers which Scudder and Harris described as very common in Massachusetts in the 1860’s, but which are not so today (Table A). These skippers probably increased here after 1600 with the expansion of agriculture (Table 1), but have declined in abundance since the late 1800’s--- in contrast to the Peck’s, Least, and Dun Skippers, which Scudder also described as common, and which remain fairly common today (Table 2). All of the species which have declined are single brooded, that is, they have not adapted to a longer growing season by having two broods, and thus have only one chance a year to increase their numbers---whereas the other three are multi-brooded. Indian, Hobomok and Leonard’s are open upland skippers; grasses are their larval host plants, but they also need nectar sources which are often in nearby wetland areas. The other uncommon Massachusetts skippers in the upland category are Cobweb, which Scudder described as “not abundant” in his day, Dusted, which to Scudder was “known from but a few localities” and Crossline, for which Scudder had ten specimens, and which was probably uncommon (Table A). Four of these six skippers (all except Dusted and Crossline) are “seasonally targeted” (Cech 2005), that is, they are univoltine, and this characteristic limits their adaptability to climate warming. Their range does not presently extend into the U.S. southeastern coastal plain. Indian Skipper has a fairly small range, flying in the northeastern states, around the Great Lakes and north into Canada, but west only to Saskatchewan and Minnesota, and south of Pennsylvania only in the interior mountains (BAMONA 2010; Opler and Krizek 1984). There is no southeastern coastal range south of New Jersey. Indian Skipper may have continued to be fairly easy to find through the 1930s, because Farquhar (1934) is able to list specimens from eight additional locations: Stoneham, Marblehead and Lawrence in the east, Princeton, Phillipston, Framingham, Worcester, and Gilbertville (near Quabbin Reservoir) in central Massachusetts, and Mt. Holyoke and Amherst in “the valley.” The Framingham specimen (6/4/1904, C. A. Frost) is at Boston University; the Stoneham specimen ( 6/2/1930, C. V. Blackburn) is at Yale. However, Indian Skipper was not found on either Martha's Vineyard or Nantucket at this time (Jones and Kimball 1943). In the 1950's and 1960's, Indian Skipper was found around Acton, and in Littleton, Belmont, Wellesley and Waltham (specimens at Yale Peabody Museum, mostly C. G. Oliver). D. W. Winter found Indian Skipper in Millis and Westwood in the 1970's, and E. M. Peters found it on 26 May 1971 in Carlisle (specimens at Harvard MCZ; Lep.Soc.Seas.Sum and Corresp. 1959-1981). Indian Skipper does not appear to be as common in this period as it was in Scudder’s time (Table 2). Little bluestem (Schizachyrium scoparius), Panicum spp, and Festuca spp. (rubra and obtusa). are the most definite and frequently-reported host grasses, with other species likely (Scott 1986; Opler and Krizek 1984). All these are native grasses in Massachusetts. The larvae will accept Kentucky bluegrass in the lab. The Connecticut Atlas raised Indian Skipper on little bluestem, Kentucky bluegrass (Poa pratensis), and other Poa species. Indian is apparently not as restricted to little bluestem as are the “little bluestem trio” of Cobweb, Leonard’s and Dusted. For example, R. Godefroi reported Indian Skipper ovipositing on Agrostis spp. in Medford, Massachusetts in June 1987 (Lep Soc. Seas. Sum. 1987). Being multiphageous could signal adaptability, but research is needed to confirm the precise grass species in use in our area. Indian Skipper also needs floral resources, and can be found in wet meadows, nectaring along with other meadow skippers such as Long Dash and Peck’s (Cech 2005; Layberry 1998). Of the six dry land skippers in Table A, Indian and Hobomok are the most likely to be associated with forest openings or edges. Our three Hesperia skippers ---Indian, Cobweb and Leonard’s--- are all about equally Uncommon in Massachusetts today, as measured by MBC sightings 2000-2007, and they were all similarly ranked during the Atlas years ( Table 5). Of the six “dry meadow skippers" in Table A, Hobomok and Dusted are somewhat more common than Indian. List-length analysis of MBC sighting data 1992-2010 showed a statistically significant 32.3% decline for Indian Skipper over these years (Breed et al. 2012). MBC sightings per total trip reports 1992-2009 (Chart 91) also show a downward trend 1995 through 2009. There are fluctuations every few years. The high reading for 1995 is due to two reports of unusually large numbers (82, 65), at Middlesex Fells Reservation, Medford, in what may have been a local population explosion. Other instances of high local populations are in the records, although no other reports from single locations exceed 50. Excluding the two high 1995 reports would reduce, but not eliminate, the downward trend. Indian Skipper has been found in 92 of 351 towns 1992-2013, whereas Cobweb Skipper has been reported from only 57 towns and Leonard's Skipper from 85. 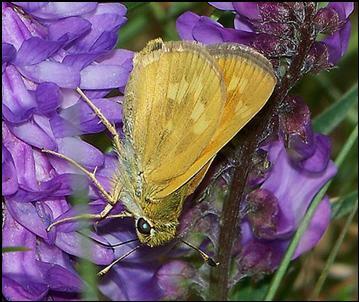 Indian Skipper is found statewide except on Nantucket. It is most easily found in the central and eastern three-quarters of the state, and is less common in the Berkshires and on the coastal plain. The Atlas found it apparently absent from large portions of southeastern Massachusetts, including Cape Cod and the Islands. There were also no Atlas records from southern Berkshire County, and very few from the central part of the state. Now, however, we have records from all those areas, and BOM-MBC data fill in many of the Atlas gaps in distribution, particularly in central Massachusetts. There are still relatively few reports from Berkshire County, and Indian Skipper has not been found on any of the Berkshire NABA Counts. But it has been found in Egremont, New Marlborough, Peru, Mt. Greylock and Williamstown, and there are also reports, mostly from the 1990's, from Charlemont, Hawley, and Rowe in western Franklin county, and nearby Plainfield and Chesterfield. One location in Florence in Northampton has provided consistently high numbers in recent years. In southeastern Massachusetts, the main location is Myles Standish SF in Plymouth/Carver, but there are also many reports from Easton, Mansfield, and West Bridgewater. On Cape Cod Indian Skipper is not common according to BOM-MBC records, but has been reported from Crane WMA in Falmouth, as well as Truro and Scusset State Beach in Sandwich. Mello and others found at least 35 in several fields at Crane WMA on 6/28/1998 during a survey for rare lepidoptera (Mello et al., 1999), but there have been few reports since. Mello and Hansen (2004: 61) remark that overall Indian Skipper appears to be less common than Cobweb Skipper on Cape Cod. On Martha’s Vineyard, Indian Skipper is now clearly present, in contrast to earlier reports. (Neither the 1986-90 Atlas nor Jones and Kimball in the 1940's had found it.) Indeed, the Vineyard appears to be a haven for all three uncommon Hesperia skippers -- Indian, Cobweb, and Leonard’s. The Vineyard checklist ranks Indian as “Uncommon” (Pelikan 2002), but there are numerous reports, for example, Tisbury Meadow, max. 31, 6/16/2003 M. Pelikan; Tisbury Vineyard Haven max. 29, 6/1/2002, M. Pelikan; and Oak Bluffs Farm Pond, max. 7, 6/15/2003 M. Pelikan. There are still no reports of Indian Skipper from Nantucket. Indian was also not found on recent surveys of the Elizabeth Islands or the Boston Harbor Islands (Mello 1998, 2003). Andover Ward Res., 5 on 5/17/2012, R. Hopping; Canton Great Blue Hill max. 4 on 6/13/2004, E. Nielsen; Chelmsford power line, 9 on 5/19/2012, B. Bowker; Deerfield, max. 8 on 6/4/1996, D. Potter; Falmouth Crane WMA, 35 on 6/28/1998, M. Mello et al, fewer in recent years; Foxborough, many reports, max. 7 on 5/31/1993, B Cassie; Holliston Brentwood CA, max. 8 on 5/31/2009, B. Bowker; Hubbardston MDC property, 11 on 6/2/2001 D. Small; Hubbardston Barre Falls Dam, 6 on 6/6/1999 T Dodd and C Dodd; Lexington Great Meadows, 15 on 6/11/1997, M. Pelikan; Medford Middlesex Fells, 82 on 6/4/1995, B. Malcolm; Monson Norcross WS, max. 4 on 6/13/2006, J. Ohop and E. Barry; Newbury Martin Burns WMA, 8 on 5/27/2012, S. and J. Stichter; Newburyport Oak Hill Cemetery, 5 on 6/4/2013 B. Zaremba; Northampton Florence, max. 141 on 5/30/2011 T. Gagnon; Plymouth Myles Standish SF, 9 on 5/23/2009 T Murray and 11 on 5/27/2013 J. Dwelly (ph); Royalston, 8 on 6/16/2003, C. Kamp; Sherborn power line, max. 5 on 6/13/2004 E. Nielsen; Uxbridge West Hill Dam, max. 8 on 5/31/1999, T and C Dodd; West Boylston Gate 36, max. 8 on 6/17/2001, M. Lynch and S. Carroll; West Tisbury Nat's Farm, 18 on 6/4/2010 M. Pelikan; Worcester Broad Meadow Brook WS, max. 4 on 6/5/2001, G. Howe. As noted, Indian Skipper is univoltine---probably obligately univoltine. It flies early, from about the third week in May to mid-July, with the largest numbers seen from the last week in May through the third week in June (http://www.naba.org/chapters/nabambc/flight-dates-chart.asp). Earliest sightings: In the 23 years of BOM-MBC records 1991-2013, the five earliest "first sightings" are 5/15/2010 North Andover Weir Hill, H. Hoople et al. ; 5/17/2012 Andover Ward Res., R. Hopping; 5/17/2000 Sherborn, R. Hildreth; 5/19/2013 Foxboro Lamson Rd., M. Champagne; and 5/20/2008 Petersham North Common Meadow, R. and S. Cloutier. The 1986-90 Atlas quoted a similarly early date: 5/20/1986 Medford, D. Schweitzer. One hundred years ago, Scudder wrote that the earliest Indian Skippers were seen “during the last week in May, the female scarcely later than the male” (1889: 1645). If we take the last week in May as 5/24-31, only seven of the 23 years produced first sightings prior to 5/24, whereas in 14 of the years first sightings were actually in the last week of May. Thus there may be only a slight tendency toward earlier emergence since the time of Scudder. Latest sightings: In the same 23 years of records, the six latest "last sightings: are 7/13/2003 Martin Burns WMA, S. Stichter (North Essex NABA); 7/11/2008 Newbury Old Town Hill S. and J. Stichter; 7/9/2000 Princeton (Northern Worcester NABA Count) T. and C. Dodd; 7/7/1996 Foxborough NABA; 7/6/2002 Central Franklin NABA; and 7/6/1997 Foxborough NABA. As can be seen, the July NABA Counts often pick up the latest-flying Indian Skippers. The Atlas late date had been 6/28/88. Scudder noted that “sometimes battered individuals may be found until the middle of July" (1889: 1645), so that there is no strong evidence of a tendency toward later flight dates since the turn of the century. In fact, since 2008, all "last sightings" have been in June. The outlook is not rosy for this species. 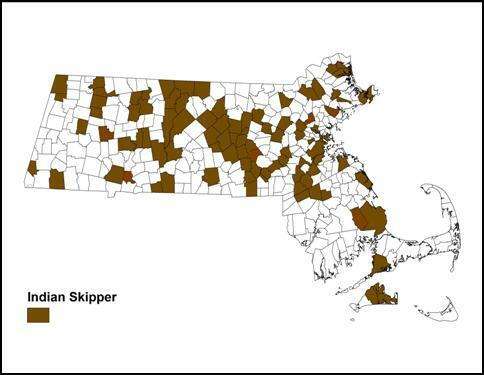 Indian Skipper should be considered a Species of Conservation Concern in Massachusetts. Indian Skipper’s lack of a southern low-elevation range and cold-adapted univoltine life style both suggest that it may be adversely affected in Massachusetts by climate warming (Table 6). The 1990-95 Connecticut Atlas did not find strong evidence of a decline of Indian Skipper in that state, but there were only 40 project records found compared to 72 pre-project, suggesting some decline. The species is ranked S3S4 there and S4 in Rhode Island and Massachusetts (NatureServe 2010), but these ranking may need to be re-visited. Around the southern and western edges of its small range, for example in Tennessee (S1), Illinois (S2), Indiana (S2), and Saskatchewan (S1), Indian Skipper is presently most threatened. Indian Skipper should benefit from preservation of the same kinds of inland dry grassy habitats that are needed by Cobweb, Leonard’s, Crossline and Dusted Skippers. It probably uses several species of grass within these habitats, and research is needed to pinpoint which grass species are the local hosts. Though not rare in our state, this is one species which needs monitoring. Proactive measures should be taken to prevent decline at known sites.